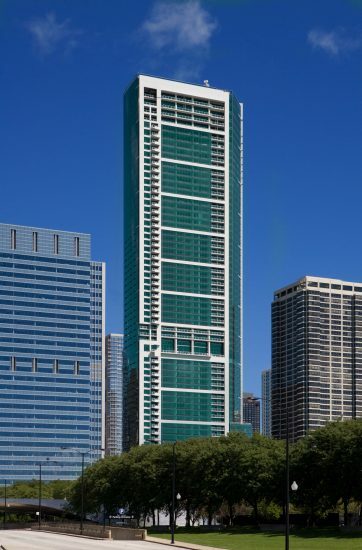 Anchoring the south gateway to Lakeshore East is Chicago’s first ecologically friendly high rise tower, 340 on the Park. This 344 ultra-luxury condominium tower was designed with a prow-like shape that steers clear of conformity and combines the richness of traditional design with the serenity of modernism. Amenities include a sky garden atrium, club room, fitness center with lap pool and spa facilities. At the time of it’s original construction, 340 commanded some of the highest prices of any new construction condos in the city.